The Jabra Elite 65t knows you don’t have time to to deal with flat batteries or audio dropping out. That’s why it’s engineered with up to 15 hours of battery life with the included pocket-friendly charging case and the reliability and dependability of Bluetooth 5.0. IP55 Water and Dust resistance means your audio companion is tough enough to handle all of life’s adventures. Enjoy truly beautiful sound with Four-microphone technology that gives you effective wind noise reduction whilst on calls, and advanced speakers that can block out or let in ambient noise. The tiny 6mm speakers are delivered into a gorgeous fashion accessory, perfect for all your day to day audio needs. Listen your way with total equaliser customisation through the Jabra Sound+ app – allowing you to personalise your audio experience. Not only that, but the clever Auto pause senses when one earbud is taken out of the ear. 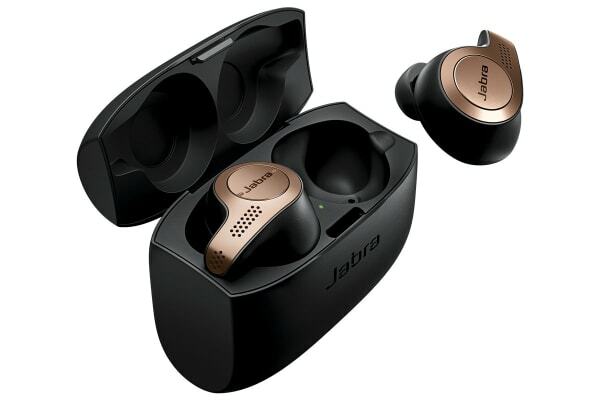 The Jabra Elite 65t conveniently allows for 2 devices to be connected at any one time- plus a total of up to 8 devices – giving you supreme sound quality with all your compatible devices.